So as it relates to the hysterectomy surgery, I wanted to know what was coming. I have two friends who had gone through one in the past couple months. They both have their own stories about how things went. And, I definitely appreciate hearing them because I wanted to go into this with my eyes wide open. I was also nervous about getting sick from the anesthesia as I have in the past. The last few times at MD Anderson, the anesthesiologist had gotten the concoction of anesthesia and nausea meds right. So, I reported for surgery at 1:15 p.m. yesterday. I went back closer to 4:00 p.m. I explained my concerns about pain to Dr. Wayman and my nausea concerns to the anesthesiologist. They both did a good job of hearing me and helping to relieve some of my concerns. When I woke up in the operating room, I was definitely in a lot of pain. I wasn’t quite sure what was hurting, but it hurt. The gave me some good pain meds, but they didn’t help. They gave me more. It didn’t help.I was in a lot of pain. Unlike the recovery room at MD Anderson, Mercy does not allow visitors in there so I didn’t get to see my parents or Alan until they moved me to my room for the night. All I remember is getting pushed through the hospital on a bed to my room, and I’m pretty sure he hit every bump he could all the way there. Once I was in my room, the nurse gave me some very strong pain killers which helped, but I still kept having major waves of pain. My doctor had told me that as soon as I was able to get up and walk around, she would remove my catheter on the stipulation that I must urinate within 2 hours or they would put it back. So, I called the nurse and asked her to remove my catheter and let me walk. The nurse tech who came in was just awful. Without going into too many details, I will just say that I told her she was rude and asked for someone else. I try my hardest to always be kind to people, and I get really irritated when people aren’t nice to me. And, when I’m in so much pain, the last thing I need is for her act like I was an idiot for not knowing that you have to walk before you get your catheter out vs. pulling the catheter out then walking. There was a lot of scoffing, huffing and puffing coming from her. It was really frustrating. Why go into the nursing field if you have zero bedside manner? From there, they sent in a new person who helped me to walk around and get the catheter removed. I believe the sharp pains I was experiencing came from spasms from my bladder. As soon as that was removed, the sharpest pains stopped. I was still in pain, but not a severe sharp pain. And I had a new nursing assistant who made my life much better through the night. 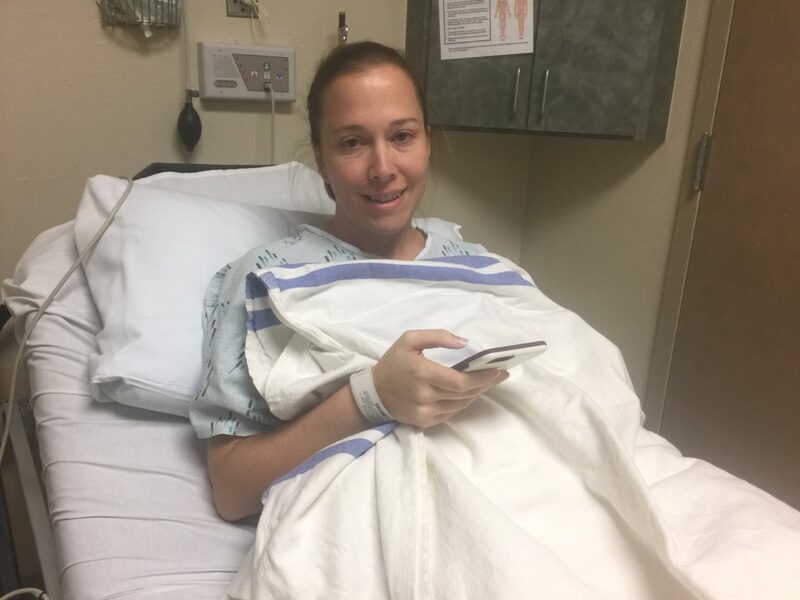 As it turns out the surgery went well, but while Dr. Wayman was in there, she checked out my ovaries (as she told me she would), and noticed that I had a large cyst on my right ovary. She said it was smooth (unlike cancer), but it didn’t look right. So, she took out my right ovary, and she has sent everything over to pathology. I should know more next week on the results of that. I didn’t have the heart to ask her what I would have to do if it were cancer. Instead, I’ll take peace in knowing that if it is something bad, I have a great God, an amazing support system and really great doctors. She also found a large fibroid on my uterus and my uterine lining was thicker than she anticipated so all of that went to pathology as well. Now, I sit at home resting. Everything is achy, but I’m trying to stay ahead of the pain for the next couple days. Alan believes that I have much more energy than I have after past surgeries so that bodes well for my recovery. This entry was posted in Maintenance, Surgery by jenny. Bookmark the permalink. Prayers for a speedy recovery and clear pathology reports! Love you!